Face-off for Fun! High-action, indoor table top gaming! Knock Out hockey combines the frenzied goal scoring excitement of hockey with the precision skill and powerful pop of boxing! Use glove to knock and block, for offensive shots and super defensive stops! Play off the high-rebound table bounderies to sneak a shot past! Squeeze the trigger faster for the most bursts of puck-popping action! Face-off for Fun! High-action, indoor table top gaming! Knock Out hockey combines the frenzied goal scoring excitement of hockey with the precision skill and powerful pop of boxing! Use glove to knock and block, for offensive shots and super defensive stops! Play off the high-rebound table bounderies to sneak a shot past! Squeeze the trigger faster for the most bursts of puck-popping action! Get Up and Play! 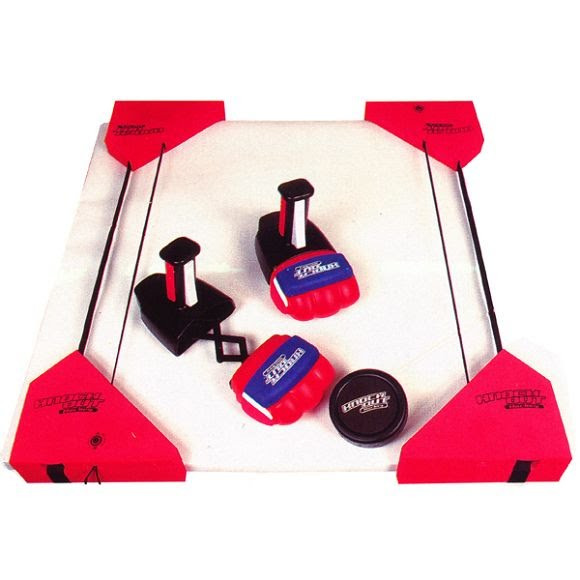 Knock-Out Hockey is constructed from soft foam and lightweight plastics that won&apos;t scratch, mark, scuff or dent tables! Play that encourages learning through bodily sensations and movement. Toys of this category help children learn through activities that challenge their hand-eye coordination and improve both their gross and fine motor skills. Children that learn best through physical play are often athletic and enjoy sports, so the optimal toys for this developmental benefit of play focus on manipulating objects, building, dancing, and role-playing or other forms of make believe that involve motion, action, and the working of big and small muscles. These kids are on the move, and they need toys that will keep up with them! Play that is independent, fostering inner reflection and awareness of feelings. While play sometimes involves many children, independent play is an important aspect of healthy childhood development. When playing alone, children begin to recognize their own emotions, feelings, and thoughts, as well as how to control them. This benefit of play allows children to take charge of their activities and explore their environment at their own level and speed. Intrapersonal play improves children&apos;s self-motivation and self-esteem, as they engage their imaginations and take the initiative to create their own forms of fun and learning. Alone play gives children the opportunity to create their own environment, allowing for pretend play that utilizes their imaginations to the fullest. These children may appear shy, but when playing alone, their possibilities are endless! - all these activities are the perfect exercise for this type of play. Our toys will be the perfect outdoor companion, providing sporting fun and activity galore! Board games Game time, make believe time - it&apos;s all fun time when other children are around to take part in play!